Commonly known as the 'rock fumewort' or 'yellow corydalis', Corydalis lutea (now reclassified and correctly known as Pseudofumaria lutea) is a hardy, yet short lived perennial plant. Native to the southern foothills of the south-western and central Alps of Italy and Switzerland, it has naturalised in a number of of other northern European countries including the southeast coast of England where the main image was taken. Under favourable conditions you can expect to grow to 15–20 cm tall with a spread of 30-40 cm. The maidenhair fern-like, finely divided foliage is yellow-green to grey-green. The yellow blooms are approximately 2 cm long and appear from April through to November. The flowers are borne in racemes on short, branched, leafy stems. Plant pot grown specimens in March. Corydalis lutea will perform best in light shade with good moisture in a free draining soil. It will tolerate both full sun and deep shade. 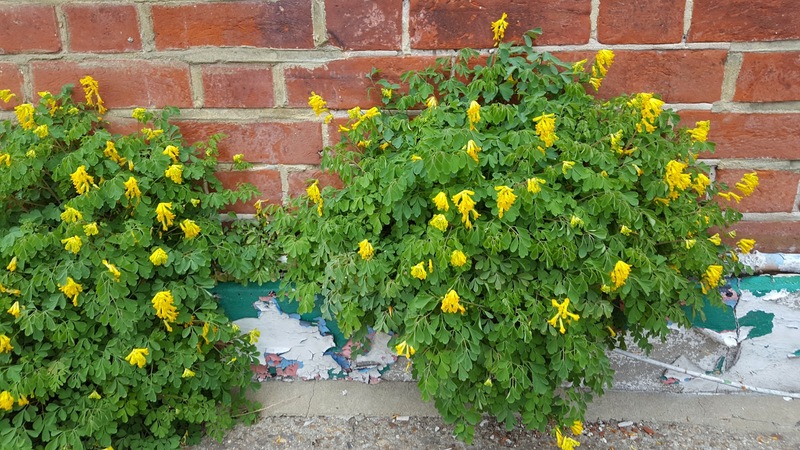 It is quite common to see Corydalis lutea growing wild in the cracks in old walls where drainage is excellent. Be aware that Corydalis lutea can self-seed in profusion, but you can keep it in check by uprooting unwanted seedlings. Corydalis lutea can struggle to cope with the high humidity and high temperatures of English summer months, or cold waterlogged soils over the winter. Note, it can look particularly attractive when underplanted with blue Grape Hyacinths.